Are you looking for a way to add interest to your Weather unit? Do you need more activities for your learning stations? 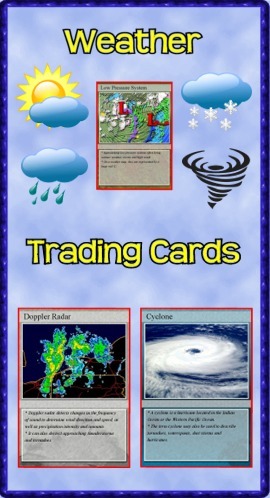 “Weather Trading Cards” is a set of 54 trading cards highlighting meteorology, weather instruments, forecasting and other weather topics. Print & laminate the cards to create a standard set of playing cards. "Educational Trading Card Games" details 3 original learning games. "Creating Educational Trading Cards" shows teachers and students how to make their own cards. This is a great product and very attractive. I've shared with our computer teacher where to find your materials and I plan to purchase more from you in the future. I have made lots of great games with these cards. I am very happy to have this resource that uses real images rather than clipart. Thank you! 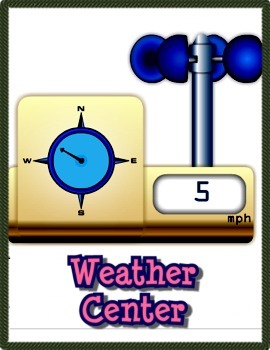 View and record the temperature, atmospheric pressure, wind speed and wind direction for your location using this online weather center. Fact-Filled Bingo is a computer program sure to bring excitement to your Consonant Blend study. The talking robot calls out random weather types/instruments/phenomenon. 40 bingo cards are provided. 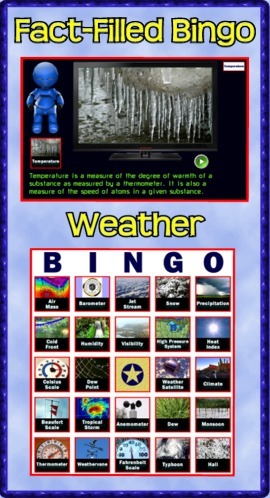 Use the companion program Fact-Filled Slideshow and a SmartBoard/projector to highlight 48 different weather topics. Again the talking robot does the narrating. As a bonus I’ve included the manual “Text-to-Speech” which teaches you how to make PowerPoints talk.